Quick & Easy effortless push in system. 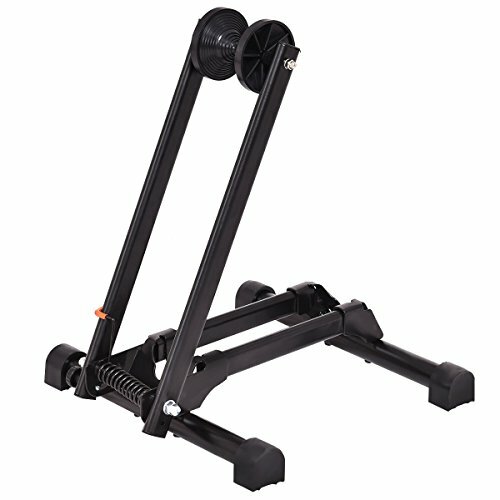 Unlike other bike stands, which you need to lift the bike and put into. Our stand's front holder will tilt when you push the bike into the rack. The bike's front or rear wheel sitting in the holder is much deeper than others, so it stays firmly in the holder. It will be perfect for heavy bikes such as downhill, mountain and beach bikes. Don't hesitate to buy it! 【Firm and Durable】The bike stand is made of iron, which makes it less vulnerable to external impact. And the surface spray paint treatment way, make it's not easy to corrode, enhance the service life. 【Easy to Carry】The bike stand weighs only 6lbs and can be folded at any time, saving storage when not in use or to carry it into the car when going riding. 【Ease to Use】Quickly pushed. Unlike other bike stands, which you need to lift the bike and put into. All you need to do is push the bike along the front end. 【Stable Stand】The bike's front or rear wheel sitting in the holder is much deeper than others, so it stays firmly in the holder, not easy to collapse. 【Wide application】 The bike stand will fit almost all bikes range from 16" to 29", don't worry about buying back because it's too small or too big to use.